Defend Gotham City from evil villains this Halloween with our Batman costumes! We have Batman costumes for regular and plus sizes in many styles to choose from. 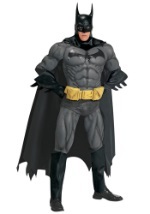 Check out our authentic replica Batman costume for the ultimate fan or take a look at our comic book Batman costumes. We also have Batman accessories to complete your classic superhero look.